The untold story of King Nebuchadnezzar’s daughter. For seven years the Babylonian princess Tiamat has waited for the mad king Nebuchadnezzar to return to his family and to his kingdom. Driven from his throne to live as a beast, he prowls his luxurious Hanging Gardens, secreted away from the world. Since her treaty marriage at a young age, Tia has lived an opulent yet oppressive life in the palace. But her husband has since died and she relishes her newfound independence. When a nobleman is found murdered in the palace, Tia must discover who is responsible for the macabre death, even if her own freedom is threatened. As the queen plans to wed Tia to yet another prince, the powerful mage Shadir plots to expose the family’s secret and set his own man on the throne. Tia enlists the help of a reluctant Jewish captive, her late husband’s brother Pedaiah, who challenges her notions of the gods even as he opens her heart to both truth and love. 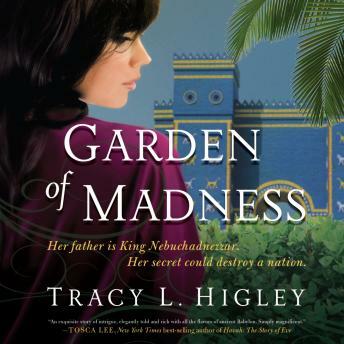 In a time when few gave their hearts to Yahweh, Tia must decide if she is willing to risk everything—her possessions, her gods, and her very life—for the Israelite’s one God. Madness, sorcery, and sinister plots mingle like an alchemist’s deadly potion, as Tia chooses whether to risk all to save the kingdom—and her family.